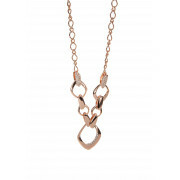 Smart and stylish, this rose gold plated necklace from Absolute Jewellery would be a classic finishing touch for day or night time outfits. Featuring large links in the centre which are embellished with sparkling pave stones. Closes with a lobster claw fastening.